New Zealand’s ‘Scoop Independent News’ has published an article on the subject of the Global March to Jerusalem by Julie Webb-Pullman – a self-described freelance writer who has been working for Scoop since 2003. 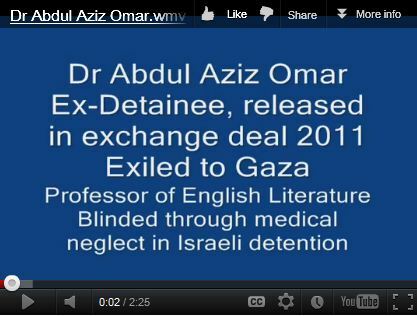 The claim by Webb-Pullman that Umar’s blindness is a result of Israeli inaction – and implied cruelty – is a lie. In a 2008 appeal to the Israeli Supreme Court, Umar himself stated that he was blinded in both eyes as a result of an illness when he was about 20 years old – i.e. around 1980. Webb-Pullman makes no attempt whatsoever during the interview to challenge Umar’s own lies regarding the “division” of Jerusalem, the “racist separation wall”, “attacks on holy places” or “damaging archaeology”. Neither does Webb-Pullman apparently see fit to inform her readers that the reason for Umar’s detention by Israel was his involvement with a Hamas terror cell which carried out a suicide bombing in a Jerusalem café in 2003 in which seven people were murdered. She is equally silent on the fact that Umar recently toured South Africa in order to promote the Global March to Jerusalem among Muslim Brotherhood supporters there. The disgracefully low standards of journalism displayed by Webb-Pullman and Scoop Independent News can, however, be better understood when one appreciates the fact that Julie Webb-Pullman is in fact not a journalist at all, but a seasoned political activist. Webb-Pullman is a member of ‘Kia Ora’ – an activist group described by GMJ endorser and International Advisory Committee member George Galloway in an e-mail to the Syrian dictator Bashar al Assad’s media advisor as a “the Viva Palestina sister organization in New Zealand“. 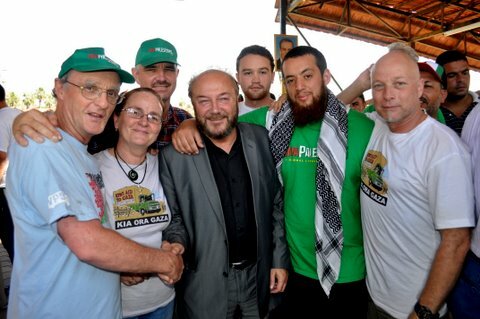 Webb-Pullman was a member of the Kia Ora delegation to a ‘Viva Palestina’ convoy to Gaza in October 2010. Her fellow travelers included Global March to Jerusalem spokesman Zaher Birawi (whom she also recently interviewed for Scoop) and GMJ organizer Kevin Ovenden of ‘Viva Palestina’, as well as Welsh activist Pippa Bartolotti. 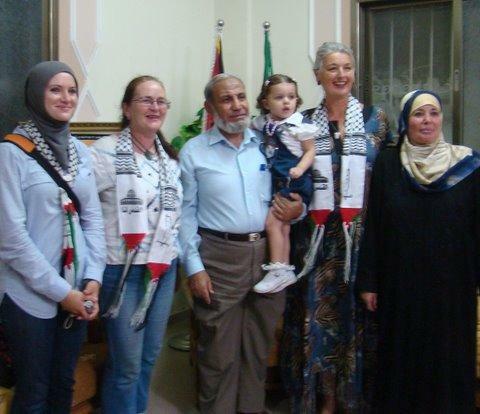 In fact, Webb-Pullman wrote an article for Scoop at the time, enthusiastically describing her meeting with Hamas leaders in Gaza and offering her autographed scarf for auction. Scoop therefore cannot claim not to be aware of Webb-Pullman’s political bias – which is made all the more ironic by the fact that in 2005 she filed a complaint with the New Zealand Press Council regarding alleged problems of “accuracy, fairness and balance and confusion of facts and opinion” by a journalist. 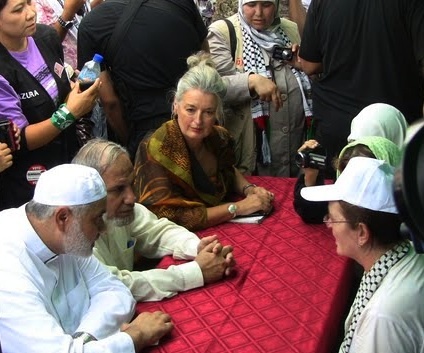 Julie Webb-Pullman (to the right with white hat) in conversation with Ismail Haniyeh and Mahmoud al Zahar. 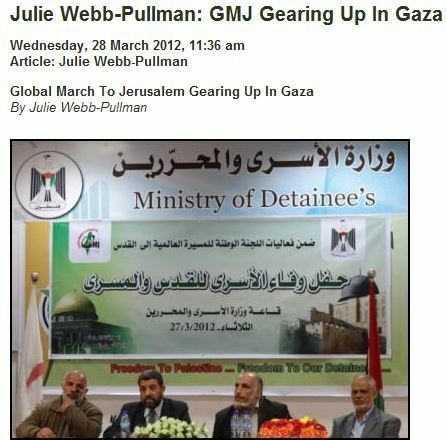 Obviously, the general public in New Zealand cannot rely on the reports put out by Hamas sympathiser Julie Webb-Pullman and her enablers at Scoop Independent News for information regarding the Global March to Jerusalem or indeed any other event in the Middle East. Speaking as a New Zealander, and is a born-again disciple of Christ Jesus – I would like to say thankyou for this site that exposes lies and reveals truth. I doubt her article has attracted much attention in NZ, but it always amazes me to learn that in one of the most remote and peaceful corners of the world there is a small cadre of the population who are so bored with their wonderful lives there that they need to worry about the Arabs. This woman needs to get a life. Unfortunately, SCOOP did not publish the correction I sent on realising the error of fact contained in this piece. The incorrect information was contained in a pamphlet given out at the event at which I filmed the interview, and I later sought verification from a liaison person, who advised me it was correct. Perhaps I should have asked the subject himself, but at the time of interviewing him I had no reason to clarify what was background information, and was concentrating on the issues at hand. I apologise for the failure to publicly correct this – I did try to do so several months ago, without success – and for obvious reasons preferred not to do it on a website such as yours. You mean a website that challenges your inability to be objective? You’re no journalist, that’s for sure – just some misguided rescuer who gets warm fuzzies from patronising and cuddling terrorists. ﻿Añadido rapidamente en eel bookmarked! !, de verdad me gusta tu web! Hurrah! After all I got a blog from where I know how to genuinely take useful data concerning my study and knowledge. on the -Notify me when new comments are added- checkbox and from now on every time a comment is added I get four emails with the same comment.
. Por ello te animamos a que te pases por nuestro portal. I think that is among the most vital info for me. And i’m glad studying your article.